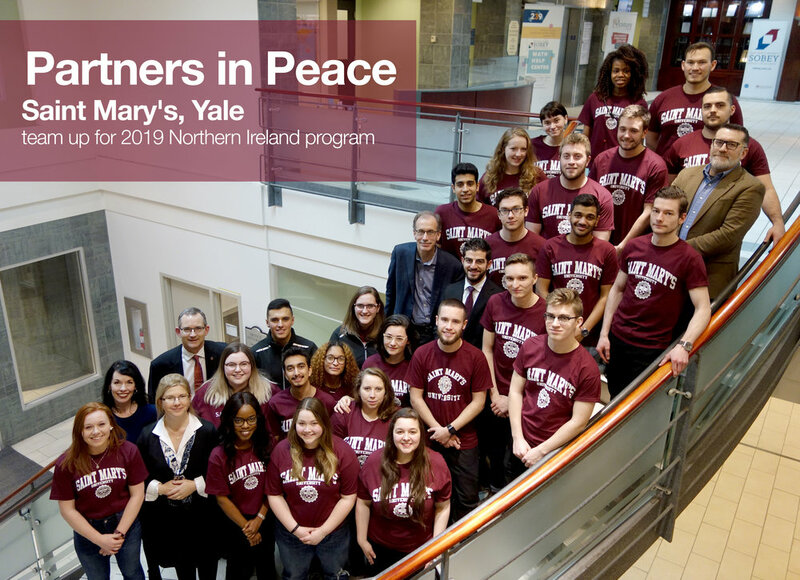 A group of Saint Mary’s students and professors departs Halifax on Tuesday, heading overseas to share peace education workshops with children in 16 schools in Northern Ireland. It’s the 14th annual trip to Belfast through the Northern Ireland Conflict Resolution Program, which provides unique experiential learning for students in SMU’s Faculties of Arts, Science and Commerce. This year for the first time, an undergraduate Yale class studying political science with Dr. Bonnie Weir is collaborating with the SMU students, thanks to technology. “They’ll have a chance to Skype into what we’re doing in real time,” says Bridget Brownlow, SMU’s Conflict Resolution Advisor and President of Peaceful Schools International. The Yale students will have the chance to share questions beyond the school programming as they join in the SMU team’s discussions with ex-combatants who are now working toward peace. Brownlow and Weir have been exploring ways to collaborate for some time. Their efforts were enhanced in November, when Brownlow and SMU President Dr. Robert Summerby-Murray took part in a symposium at Yale, co-hosted by Queen’s University Belfast. Titled “Twenty Years of Peace: Progress and Possibilities in Northern Ireland,” the conference brought together academics, community leaders, politicians and architects of the Belfast/Good Friday Agreement, which in 1998 marked a formal end to the conflict in Northern Ireland. Another twist for this year’s trip to Belfast is the new series of storybooks launched in October by Peaceful Schools International, with support from SMU and SMUSA. Already shared locally with more than 1,000 elementary schoolchildren, the books were written and illustrated by three Halifax junior high students. The Saint Mary’s students have created interactive workshops based on these books. To date, their efforts have been very well received by local children. One of the books, Animal School, has just been translated into Irish (by Prof. Neil Ó Briain of the Department of Irish Studies at Saint Mary’s) and will be presented to a Bunscoil An Tsleibhe Dhuibh, a long-term Irish medium school. Plans are underway to translate the other two books. The Saint Mary’s team, including 25 students and four faculty members, will return to Canada on February 25. It’s the most diverse group of students to date, says Brownlow, adding it includes international students from as far away as Bangladesh, Yemen, Nigeria, Brazil, India and Jamaica. Dr. Catherine Loughlin, Associate Dean of Research and Knowledge Mobilization for the Sobey School of Business, is collaborating with Dr. Carver on the role of women internees in Northern Ireland. For updates on the initiative, please follow Peaceful Schools International on Twitter at @PeaceatSchool and Facebook at @peacefulschoolsinternational.